This is a small growing species but not the neatest. The 2cm equitant growths (the leaves fold around the stem so that they overlap the one opposite and above in a fan shape) produce vegetative shoots that produce another growth a few cm above the original. The end result is a scrambling plant that then produces cute little flowers (shown here) on thin 10cm spikes. The species is endemic to Cuba which makes it rather special. 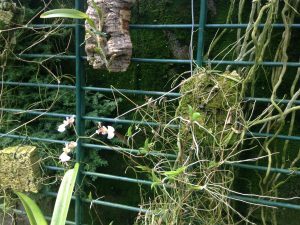 We are planning a permanent display at the Bristol Aquarium to highlight the importance of Islands in biodiversity and conservation and so Oncidium hawkesianum will be sure to feature. 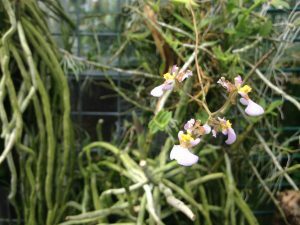 It is also known as Tolumnia hawkesianum.